Or we can contact you! Renowned wildlife artist Robert Bateman is inviting youth to celebrate the spirit of International Year of Forests and reconnect with nature through the 2011 Canadian Wildlife Federation Robert Bateman Get to Know Contest. Launching during National Wildlife Week from April 10 – 16 at museums, zoos, aquariums, and parks across Canada, the contest provides young people with the opportunity to use their creative abilities to develop a broader understanding of, and appreciation for, the natural world. 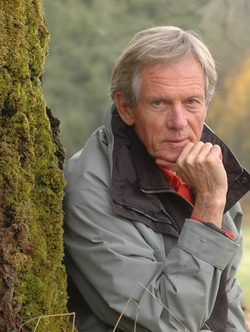 Robert Bateman launched the Get to Know Contest in 2000 to inspire Canadian youth to “get to know their wild neighbours” by getting outdoors and actively connecting with nature. Over the last ten years, it has grown into Canada’s largest nature art, writing, and photography contest for youth, spreading the key message that caring about the environment begins with meeting the magnificent neighbours of other species found in our own backyard. By fostering a more active lifestyle and a deeper connection with nature, the Get to Know Contest endeavours to cultivate a generation of healthy, environmentally-conscious youth. Winners of the 2011 Get to Know Contest will receive all sorts of prizes, including a one-week stay at Gulf Islands National Park and Reserve and Fort Rodd National Historic Site in Victoria, BC. Here they will be joined by the winners of the US Get to Know Contest to attend creative workshops and educational seminar sessions. Other prizes include cash, Panasonic digital cameras; art supplies from Opus; books from Scholastic; and the publication of winning art and writing pieces in the 2011 Robert Bateman Get to Know Contest Calendar. Entries can be submitted online at www.gettoknow.ca between April 10th and May 23rd. Recently, the Get to Know Program learned that the latest edition of the Oxford Junior Dictionary no longer contains the names of over ninety common plants and animals that had previously been included, such as “beaver”, “porcupine”, “dandelion”, “ivy”, and “poppy.” The reason? These words are no longer considered relevant enough to be included in a children's dictionary; they were instead replaced with words like “database” and “block graph.” This decision follows a recent study which found that among children aged 10-12, half could not tell the difference between a bee and a wasp, and only 53 percent were able to recognize an oak leaf. What does this mean for us in the future? Stephen Kellert, a prominent Yale nature researcher, says that “play in nature, particularly during the critical period of middle childhood, appears to be an especially important time for developing the capacities for creativity, problem-solving, and emotional and intellectual development.” Likewise, author Richard Louv describes how children and adults alike suffer from “nature deficit disorder”—a term he uses to describe the “cumulative human costs of alienation from nature, including diminished use of the senses, attention difficulties, and higher rates of physical and emotional illnesses.” Current research backs up these insights, showing that “children are smarter, better able to get along with others, healthier and happier when they have regular opportunities to be in the out-of-doors.” With your support, this is precisely what we can continue to achieve: a generation of youth who have the understanding, motivation, and resources they need to be effective global citizens and stewards of the natural world. In the past decade, the Robert Bateman Get to Know Program has connected hundreds of thousands of young people with nature by encouraging them to “get to know” their wild neighbours. The program provides youth with direct, hands-on learning opportunities through cutting-edge educational initiatives based on current research and developed in conjunction with leading educators. The Get to Know Program envisions a continent-wide shift in thinking, towards an understanding that conserving biodiversity is our shared responsibility. By encouraging young people to regard other species as important members of their community, we are working to restore the link between youth and the environment, and foster the next generation of passionate environmental stewards. Recent Get to Know initiatives include Virtual Hikes - interactive learning resources which introduce youth to local green spaces; Natural Treasure, a program which draws youth outside to local parks in search of hidden hieroglyphs; and the Get to Know BioBlitz, an event which will see youth exploring participating natural areas under the guidance of naturalists, spending time to learn about various local flora and fauna, recording their findings, and sharing what they discover. Find out more at www.gettoknow.ca. Kellert, Stephen R. "Nature and Childhood Development." In Building for Life: Designing and Understanding the Human-Nature Connection. Washington, D.C.: Island Press, 2005. Louv, Richard. Last Child in the Woods. Chapel Hill, NC: Algonquin Books 2005. Burdette, Hillary L., M.D., M.S. ; and Robert C. Whitaker, M.D, M.P.H. “Resurrecting Free Play in Young Children: Looking Beyond Fitness and Fatness to Attention, Affiliation and Affect.” © 2005 American Medical Association.